IzzyElfBlog: Now Deedy is Comparing Lafayette to the Beatles. What can we say?? Now Deedy is Comparing Lafayette to the Beatles. What can we say?? A Bigger Draw than the BEATLES!!! When I was writing the Afterword for A Buss from Lafayette, I compared the huge crowds that greeted Lafayette everywhere he went on his 1824-5 Farewell Tour to the welcome the Beatles received when they toured America in the 1960s. To my astonishment, the editor took this comparison out, saying that young readers today wouldn't know anything about the Beatles or their U.S. tours. However, Ron Howard might have fixed this situation, through his new movie, "The Beatles: Eight Days a Week - The Touring Years” (2016). Funnily enough, we went to see it on the recommendation of our friend, Alan Hoffman, President of the American Friends of Lafayette. As I watched, however, I kept being struck by the parallels between how the Beatles and Lafayette were received. First of all, I learned something new about the Beatles: they refused to play at the Gator Bowl if the audience was segregated. They carried the day, and apparently their performance was the first event attended by an integrated crowd there. In a similar way, Lafayette, who was an abolitionist, made a point of greeting African-Americans during his Farewell Tour. 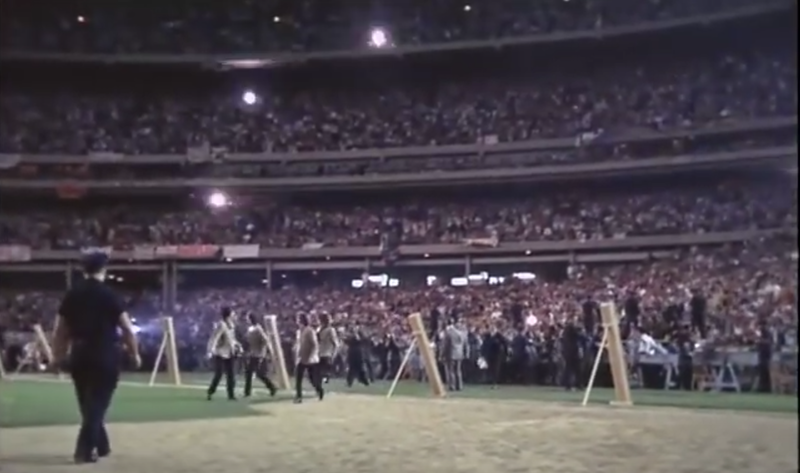 A Screen Shot from the Video: this only shows part of the crowd. There were 55,600 people in the stadium that day. Of course, there were other acts on that concert, but it appears that the Beatles were the main draw. Now try to picture a crowd nearly twice as large: 100,000. That’s how many were in attendance when Lafayette dedicated the cornerstone of the monument at Bunker Hill on June 17, 1825. Keep in mind that there was no P.A. system. Only a very few people there would have been able to hear Lafayette’s voice. The crowd was gathered there simply for the chance to catch a glimpse of the hero of the American Revolution who was a living link to our history. We can't believe she called us CHEEKY! We Izzies are happy that SHE's happy!